Chris Baker, of Susanville, a fire science instructor at Lassen Community College, has been appointed as a member of the board of directors for the National Fire Heritage Center. The National Fire Heritage Center is the nation’s archive for historical documents and other perishables related to fire protection. These perishables include: Art and artifacts, audio books, charts and graphs, documents, maps, photography, reports and videos. The nonprofit center, based in Emmitsburg, Maryland at the National Fire Academy, named Baker as a member of its board of directors on Oct. 8 after the National Firefighter Memorial Weekend held in Emmitsburg. Senior staff members from the National Fire Academy and fire service dignitaries were on hand to celebrate the retirement of several board members and trustees and the installation of new board members and trustees, including Tonya Hoover, National Fire Academy superintendent. From July 2009 to July 2016, Hoover served as the California State Fire Marshall. California continues to have a strong influence on the organization. Baker has more than 10 years of experience in volunteer, combination, and career fire departments in California. Baker holds a bachelor of arts degree in anthropology from Pacific Lutheran University, and an associate of science degree in fire service command company officer from Shasta Community College. He is a California State Fire Training certified fire-officer, driver-operator, fire instructor and Lead Firefighter I certification evaluator. 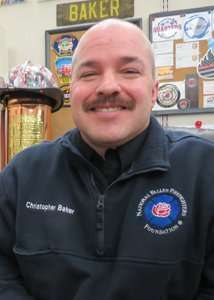 Baker is a fire science instructor in the California community college system. He is a volunteer Advocate Regional Manager, Region IX for the Everyone Goes Home Program through the National Fallen Firefighters Foundation.